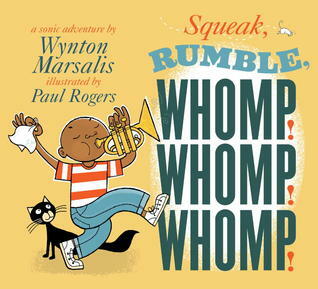 Title: Squeak, Rumbple, Whomp! Whomp! Whomp! GoodReads Summary: The creators of Jazz ABZ are back for an encore! With infectious rhythm and rhyme, musical master Wynton Marsalis opens kids’ ears to the sounds around us. What’s that sound? The back door squeeeaks open, sounding like a noisy mouse nearby — eeek, eeeek, eeeek! Big trucks on the highwayrrrrrrrumble, just as hunger makes a tummy grrrrumble. Ringing with exuberance and auditory delights, this second collaboration by world-renowned jazz musician and composer Wynton Marsalis and acclaimed illustrator Paul Rogers takes readers (and listeners) on a rollicking, clanging, clapping tour through the many sounds that fill a neighborhood. What I Think: I enjoy picture books that exude exuberance and energy. The illustrations in this book are as lively as the text. The entire book is packed with onomatopoeia for musical sounds the boy is hearing as well as everyday sounds that seem musical to him. I know I've seen commercials like this where you hear a sound and then they blend all sorts of everyday sounds together in such a way that it sounds like a true song. It's pretty cool. This book asks readers to stop and think closely about the sounds around them and how these sounds are really the soundtrack of life. Onomatopoeia is such a cool literary device. It can be used in a super sly way or it can be super obvious like it is in this book. It seems like kids to love songs and love turning anything into music so I can see how kids would enjoy this book. I think this would make a great mentor text for talking about how a writer's description helps a reader to visualize. And visualizing is more than being able to see what the author wants us to see...it's about truly being there in the moment. Sounds and smells and emotions that are called up are just as important in being able to visualize as what we see. Showing and not telling truly incorporates all of our senses. I love how this book and the others below truly take the readers with them to a different place and mood because of how the sounds are incorporated. -quick where it itches the most. Writing Prompts: Close your eyes and listen to sounds all around you, write a description of what you hear or how the sounds around you tell a story.